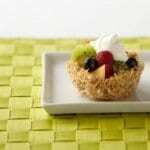 Fruit Filled Baskets | JPMA, Inc.
Juicy fresh fruits and yogurt sweetened with banana fill these tasty, cereal baskets. In medium bowl stir together cereal, egg white and butter. Line six 2 1/2-inch muffin pan cups with paper liners or foil liners. Use back of spoon to firmly press cereal mixture on bottoms and up sides of prepared cups. Bake at 350° F about 10 minutes or until beginning to brown. Cool completely in cups. Remove from cups. Peel paper or foil liners off baskets. Meanwhile, in small bowl stir together banana, yogurt and vanilla or cinnamon. Cover and refrigerate until needed. Fill each basket with fruit. Spoon yogurt mixture on top. Serve immediately.